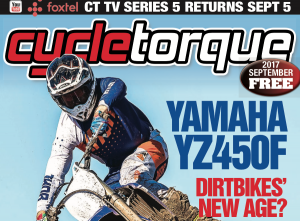 On the cover of the September issue of Cycle Torque is Yamaha’s smartphone-enabled YZ450F motocrosser. There’s a host of changes to the engine and chassis, and oh, the kickstart mechanism has been completely wiped! Make sure you read Todd Reed’s first impression from the Australian media launch. Also tested in the issue is Austria’s finest nakeds, Nigel spent some time on KTM’s 2018 Dukes including the 1290 Super Duke R, GT and the learner-approved 390 Duke. The big girls have had a bit of engine work to comply with Euro4, plus you can hook your phone up to the display on all three bikes and control it through the switch block. They also get some pretty cool updates to that cutting-edge Duke style which KTM does best. Want to ride all seasons on a budget? We’ve got the gear for you. There’s everything from helmets, jackets, pants, gloves and boots to thermal underwear and waterproof overpants. You can do it all year round and you don’t have to spend a fortune (or shop at Aldi!). Darryl Flack eulogises Angel Nieto Snr, who marked out one of the most remarkable careers in some 20 years of GP racing. Smarty looks at the rise and fall (and rise again) of Zach Osborne, a 2004 World Junior Motocross Champion who’s faced ten years of struggle before he became 2017 AMA 250 MX Champ. Ryan reckons this year’s Australian MotoGP race could go down as one for the history-books with five riders vying for the title.